One afternoon near Kyoto I found myself looking through a pane of glass at a man standing over a large, flat, hot griddle. He held a large spatula in one hand, and would reach for various ingredients flanking his workstation with the other. I stood watching him for a few minutes as he turned out egg-battered cabbage on to the hot grill, formed the mixture into flattened cakes, and cooked each side until golden. An older Japanese man walked up beside me, probably noticed the perplexed look on my face, smiled and said to me, "Japanese Pizza." Later, after asking around and doing a bit of reading, I realized I was watching the man make okonomiyaki. Not at all like pizza at first glance, it does have many things in common - namely shape, the ability to easily customize each one, and affordability. Okonomi means something along the lines of as you like it, or what you like or what you want. It is street food made to order. And if you're asking me, the type I ended up making is more like a thin frittata than a pizza. Whatever you want to call it - it's satisfying, nutritious (particularly if you don't load it up with endless toppings, sauces, and mayo), and endlessly adaptable to what is in season or on hand. It's also quick to make at home. There are various regional styles of okonomiyaki that I'm not going to get into, but the recipe you see here today is my Cali-interpretation of Osaka-style okonomiyaki made with the cabbage I had left-over from Bryant Terry's Jamaican Veggie Patties, some toasted almonds for crunch, and fresh chives. My pal Harris writes about Funchu-style okonomiyaki on his site. A hefty layered creation starting with a thin layer of crepe/pancake batter. I encourage you to give this a go - even if you think you don't like cabbage. I think it's good enough to convert people into cabbage fans. 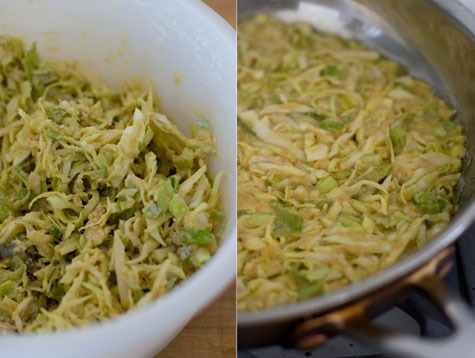 And if you end up with leftover cabbage, there are a number of other cabbage recipes in the archives: a rustic cabbage soup, a zesty lime and peanut coleslaw, and this cabbage salad with a simple miso dressing are all favorite ways I like to use it.